Jack Lewis, resident firearms expert for Cowan’s Auctions, notes a real market shift in the collectibles market. There is much less interest in those top-tier guns costing hundreds of thousands of dollars in the past year. Demand for vintage firearms is still very strong, he stresses, but is now focused on items in the $1,000 to $50,000 range, and steadily pushing up prices within this category. World War Two firearms are especially hot right now, including M1 Carbines, U.S. military sniper rifles, and any and all 1911 handguns. On the European side of things, he notes that German bolt action rifles from 1900 to 1930 are moving especially well. That’s increased interest in accessories for these rifles, too, including optics. For their May auction, Cowan’s will present a selection of German made, claw-mounted optics, for manufacturers that include Zeiss. 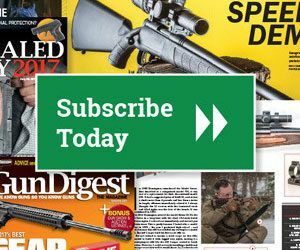 Editor’s Note: This brief originally appeared in the June 12, 2014 edition of Gun Digest the Magazine.